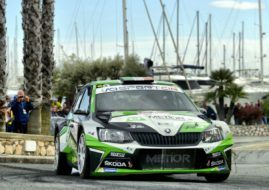 Between recent Mexico’s round of the World Rally Championship and the opening round of the European Rally Championship, scheduled for the next weekend at the Azores, several national rally events took part previous weekend in Europe with big names participating and taking wins. Citroen’s factory driver and former Junior WRC champion Stephane Lefebvre entered the 58th Rallye Le Touquet – Pas de Calais, the opening round of the French Tarman Rally Championship. Sharing the #2 Citroen DS3 WRC with navigator Gabin Moreau, Lefebvre took a dominant victory ahead of Bryan Bouffier (Hyundai i20 R5) and Yoann Bonato (Citroen DS3 R5). For Lefebvre, it was his first rally event this year, the next would be Tour de Corse where he would fight for WRC2 points in a Citroen DS3 R5. 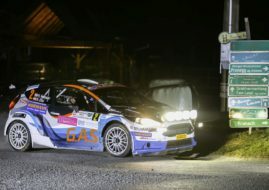 One more great event on the previous weekend was the Rebenland Rallye, the second round of the Austrian Rally Championship. The Austrian rally legend and defending champion Raimund Baumschlager crashed hard during the first day in the #1 Škoda Fabia R5. He suffered some injuries and was taken to a hospital. The rally winner was Niki Mayr-Melnhof, who was sharing the #2 Ford Fiesta R5 with a navigator Leopold Welsersheimb. 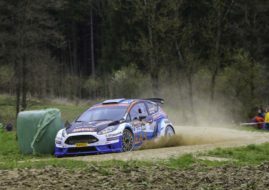 He won with an almost three-minute advantage over Jan Černy (Ford Fiesta R5). Gerwald Grössing (Ford Fiesta RS WRC) completed a podium.